National Geographic Channel is airing "Live From Space," a two-hour unprecedented special from inside NASA's Mission Control and from onboard the International Space Station on Friday, March 14 at 8 p.m. EDT. HOUSTON — Space station history will be made tonight (March 14) and it will be broadcast "Live From Space" for the world to watch. For the first time, NASA is opening the doors to its active Mission Control Center in Houston and letting a television broadcast follow the International Space Station live as it completes a full orbit of the Earth. "We're with the astronauts for two hours and we're seeing what they see," Al Berman, executive producer of "Live From Space," told collectSPACE. "We are looking down through the [windowed] Cupola as we pass over mountain ranges and towns, countries and oceans, and we go from day into night and back into day again, sunrise and sunset and then a little bit more. And while all that is unfolding, we are showing a really tremendous backstory about what is happening on the ISS, what is behind the scenes. It is a real eye-opener." "I don't think audiences have seen anything that compares to this," he continued. "If they've any interest in space at all, I think they will be riveted throughout the entire time." No one, however, may be more on the edge of their seats than Berman and the Arrow Media team of 100 people in Houston, given what it will take to pull off this broadcast. "I think our business is risky, it's live and exciting," shared Berman about TV production. "We have redundancies, and redundancies for the redundancies. We try to prepare for everything. But it's nothing compared to what they [NASA] do. That's one of the things I have learned on this project." Live TV has its fair share of challenges but they generally don't include having to worry about a rogue piece of space junk taking out your actors and set. Setting a show within the dynamic environment that is the International Space Station means having to take on all the same concerns that NASA has to consider on a round-the-clock basis. Pieces of satellite debris have resulted in having to move the almost million pound space station out of the way. The failure of a single valve can — and has — taken offline half of the outpost's systems. But it doesn't need to be something as dramatic as a real emergency in space to cause problems for the "Live From Space" production. "Smoke alarms can be triggered by other activities on the space station such that they are false alarms, so what do we do?" Berman observed. "The answer is that we are prepared to do everything from buying a few minutes to doing an entire broadcast without the signal from the station," he revealed. "We even have a backup location that we can go to, if we need to." If everything goes as planned, veteran journalist Soledad O'Brien will host "Live From Space" from the visitor gallery overlooking the space station's Flight Control Room (FCR, pronounced "ficker"). From there, she will speak live with NASA astronaut Rick Mastracchio and Japan Aerospace Exploration Agency (JAXA) astronaut Koichi Wakata, the space station's commander. O'Brien is also scheduled to enter the FCR to tour some of the consoles from where the outpost is controlled from the ground. But when exactly those things happen remains in flux. "We lose signal from the station about every 20 minutes," Berman said, "so there are times we cannot communicate [with the astronauts]." "The margin of error is plus or minus two minutes on any of these [live] windows. So if we lose [the astronauts] for an additional two minutes, then we have taped packages we can put on," Berman explained. Those produced features will also be the answer should a smoke alarm, or something more serious, occur during the live broadcast. "We've more packages then we need because who knows what's going to happen?" Berman said. "We're live, they're up there, anything can happen." Japan Aerospace Exploration Agency astronaut Koichi Wakata poses for a photo at a window in the Cupola of the International Space Station while the Canadarm2 robotic arm's Latching End Effector appears to be looking through the window from outside the station. "Houston, we've had a problem" calls aside, Berman told collectSPACE that producing "Live From Space" has been a personal highlight of his career. "I watched man walk on the moon, I've been fascinated by space forever," Berman shared. "To be able to be in this environment and be in such capable hands and get such extraordinary cooperation has made this one of the most fun things I have ever worked on." "[The space station team is] very professional. They trust us and that trust has resulted in us getting a concerted effort to help make this the best show possible," Berman said. "I think it is great for them and it is great for us." "Live From Space" is not a one-shot-and-your-done deal. At the very least, Berman will produce it twice. On Friday, National Geographic Channel will air the broadcast in the United States and 169 other countries. Two nights later on Sunday, Channel 4 in the United Kingdom will get their own version of "Live From Space" with just a few changes (Dermot O'Leary of "X Factor" fame will replace O'Brien as host). But should all go as smoothly as is planned, Berman sees "Live From Space" as a launch pad for future shows. "I think this is a sign of NASA wanting to do things like this," he concluded. "I think if all goes as we plan, there may be more, many more. Maybe we will be broadcasting live when they go to Mars." 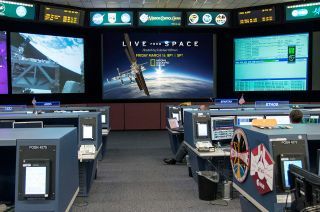 Click through to collectSPACE.com to see a behind-the-scenes photo of National Geographic's "Live From Space" set inside NASA's Mission Control.